A.A. Rich and Associates installed and monitored thermographs that recorded water temperature during the summer of 1999, as part of a fishery resource conditions study. For several reasons, the bacterial sampling effort has been discontinued. First, because of the complex nature of the watershed (tidal and non-tidal), we were not able to identify the source(s) of the high bacterial counts. Second, it is time-consuming and difficult to organize a high quality, all-volunteer effort and we could not continue to provide that level of commitment. Third, we attempted to obtain funding to implement a professional sampling effort, designed to identify sources, but we have not been successful. We would like to continue the program when funding is available. Friends collaborated with Ross Valley Sanitary District on site selection for the Healthy Waterways projects, a bacterial monitoring project that measured E. coli, total coliform, and several species-specific forms of bacteroides. Five non-tidal sites were sampled during September (dry season) 2009: Larkspur Creek, Corte Madera Creek, Sleepy Hollow Creek, Fairfax Creek, and San Anselmo Creek. The current board of the Ross Valley Sanitary District has stopped funding E. coli testing. During several summers, we noticed a degradation of water quality in upper Ross Creek during the summer when flows are low. During 2011, water samples were collected on three days, about a month apart, at four locations covering some 1,600 feet of Ross Creek. For comparison, one sample was collected from San Anselmo Creek at Creek Park, upstream of the confluence of Ross and San Anselmo creeks. Download the technical report describing the results here: FeMn_Report_2011.pdf (4300 KB). 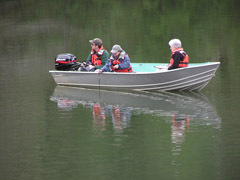 A summary of the report is in the January-June 2012 issue of Creek Chronicles.